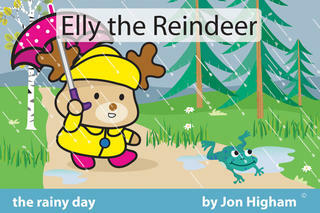 In this latest adventure, Elly the Reindeer finds herself wondering what to do on a very rainy day. She decides to telephone her woodland friends but they are not at home. Where could they be on such a wet day? 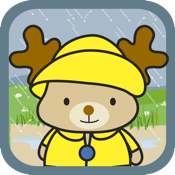 Join Elly as she braves the weather to go out and search for her friends. Now with interactive sound buttons and optional narration (to be rolled out across all Elly titles during 2011). Regularly featured in apple’s ‘what’s hot’ (book section), the Elly series has charted in the top 100 iPad books in over 12 countries with some titles reaching the top 100 in over 30 countries. "The apps have clean and beautifully structured illustrations, that make excellent use of colors and proportions, really helping on our kids’ visual education. Stories are simple and fun, the ones that kids ask us to read over and over." "The book content is very nice and easy to read and would be a great group of books to read with anyone’s children." "I truly enjoy reading about Elly the Reindeer and her woodland friends. I find the illustrations adorable and the stories are clever and sweet.."
I think “Elly Book 5” and the entire “Elly the Reindeer” series in general are wonderful choices to read to even the youngest child who may have a short attention span or be overwhelmed by sounds, movements, and the tapping you find in other apps. Jon Higham is a published author and illustrator of 25 years experience in the childrens publishing market and has worked for major clients in the UK. Jon is also a regular illustrator for an eminent Childrens magazines. Rose Higham, narrator, is a drama student and the author’s niece. This app contains NO ads, in-app purchases, push notifications, tracking, or any data collection whatsoever. This app does contain a link to our Facebook page for more information and promotion details, and links to the iTunes app store in reference to our other similar apps. These links are found only on screens at the end of the app and independent of the book page screens. Tizio Publishing is a member of Moms with Apps, a collaborative group of family-friendly developers seeking to promote quality apps for kids and families.